At some point in time over the course of its nearly fifteen year lifespan, the Fast and the Furious franchise shed its tiring roots and became a far more interesting beast because of it. The original film was the result of a now antiquated era, a period of cultural befuddlement that occurred during the transition between the filthy grunge of the nineties and the iPod slick of the naughties. The Fast and the Furious never should have stood the test of time. 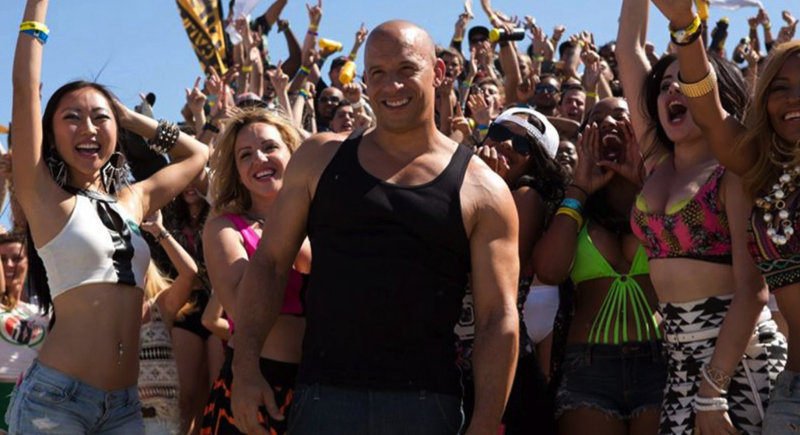 And yet somewhere within the depths of cultural hell, Wheatus, the Mini Disc Player and Josh Hartnett are shaking their fists up at Dominic Toretto and co. because somehow, fourteen years after the initial arrant imitation of Point Break, the latest entry into the series is one of the most anticipated blockbusters of 2015. ‘Most anticipated’ is used here in the way that Hollywood advertisers have appropriated the term. Many people, most in fact, are probably not anticipating the release of Furious 7 in the slightest. But the franchise has nonetheless carved out an ardent following. A lot of this has to do with the perseverence of Justin Lin, who directed the series from Tokyo Drift through to Fast and Furious 6, although he has relinquished creative control for this most recent instalment to James Wan, of Saw and The Conjuring fame. Lin anticipated the decline in relevance of the series’ fundamental characteristics and set about re-imagining the fictional world as a string of over the top heist movies. Furious 7 has a cast and an enthusiasm for cars in common with Rob Cohen’s The Fast and the Furious, and that’s about it. Under Lin’s creative control, the series has developed into one of the most complex and beloved fictional worlds in contemporary mainstream cinema. Fast and Furious devotees can even enjoy Los Bandoleros, the short FandF film directed by Vin Diesel himself, or Better Luck Tomorrow, the 2002-crime film that examined the supporting character of Han as he navigates his way through high school. The narrative of Furious 7 takes place just after the closing moments of Fast and Furious 6 and connects the series’ continuity up to the conclusion of Tokyo Drift, which was the third entry into the franchise. Letty (Michelle Rodriguez), who lost her memory in an ill-advised plot progression in the previous film, has rejoined the gang in an attempt to pick up her mental pieces. Toretto (Vin Diesel) and co. are mourning the loss of Han, who was murdered by Deckard Shaw (Jason Statham), the older and reportedly far more dangerous brother of the villain from Furious 6. Desperate and seeking revenge for his fallen brother (if we’re to go along with his slightly manic obsession with calling his friends ‘family’), Toretto turns to a shady government agent (Kurt Russell) who offers them the opportunity to track down Shaw and finish the game of cat and mouse once and for all. If we’re all being honest with ourselves, plot has never been paramount in these films, even under the direction of Lin. What Lin brought to the series was an uncanny knack for polishing turd into diamonds. Fast Five and Fast and Furious 6 (the franchise has always had a cavalier regard for titular coherence) were the zenith of this idea, and left a lot of filmgoers ashamed at just how much they’d enjoyed them. Furious 7 reaches for these heights but Wan doesn’t have the natural ability to make us forget that we’re watching a Fast and the Furious movie. In terms of content, nothing has changed. The dialogue is still awful, the characters still paper thin, the situations baffling. In the previous couple of instalments, we didn’t notice. We do here. The endurance of this franchise might always baffle us, but Furious 7 is a step back.